Notes: Based on a manga by Tanaka Kunihiko. Fam, a catgirl who communes with spirits, and Iri (or Ihrlie if you prefer), a headstrong swordwielder, are a pair of Ruin Explorers, who search the remnants of ancient civilizations for riches and fame. They embark upon a quest to search for the "Ultimate Power", and along the way, are joined by a pair of rivals, a con man and his dog, and a prince, and set out to defeat the corrupted priest Rugudorull, who intends to control the world. We had such high hopes for this series. It's a wonderful, wonderful ride, with a cast of likable and interesting characters, a great storyline, and plenty of humor. The problem is it's about two OAVs too short, and the crash at the end leaves you so dazed, you wonder what happened after all. For now, let's concentrate on the good points. Fam has to be the single most likable catgirl in anime history after Nuku Nuku. She's cute, without being sugary or annoying - she's just a sweetheart who is actually quite capable with her skills as a spirit medium. And Iri is an even rarer character - a strong female character who does not fall into any stereotype. Feminine, but not girlish, and she wears practical armor (she *gasp* covers herself!) but not butch (despite a few jokes in OAV 3) ... Iri is her own woman, and she belongs to no such conventions. Realistic and refreshing after so many Xena clones. If anything, Ruin Explorers can't be called a cliche. Sure, Fam and Iri fall into their share of traps (we always need gags, right), but when push comes to shove, they try their hardest. And they're hardly munchkin characters - none of the characters in this story are, especially considering Iri's curse - when she casts a powerful magical spell, she polymorphs into a mouse. (Fam always carries medicine just in case.) Their rivals, Rasha and Miguel, are suitably funny - highly skilled, but not perfect. Miguel, for example, is the swordsman who's never been cut - but being punched is another story entirely! Lyle may be a prince, but he still needs to train his skills under Miguel, because he's not quite *that* good. And the con man and his dog aren't useless by any means - if anything, it's their actions that catalyze the series. The plot itself is fairly standard "collect-the-magical-items-to-get-the-Ultimate-Power" plot, but how the characters dealt with the situations presented was clever. Even at the final battle (such as it was), the old man and the dog (who you'd think would be useless) do more than their fair share. Much like Ozanari Dungeon and other fantasy series, every character has a purpose and their own agenda. And it works well for three and a half OAVs. Unfortunately, Ruin Explorers simply ran out of time. The fourth OAV throws in a lot of things never explained or even hinted at beforehand. How's Iri connected to Rugudorull and the forbidden magicks? What was the significance of the magic stone when Rasha had ever heard of it before? Why was Rugudorull such a pushover, and his castle so weakly defended? What was with Lyle's fiancee returning anyway? It doesn't make sense, and it simply was a letdown after such a high-quality beginning. And after the final battle...well, we won't spoil it, but it's pretty bad. You never find out about how Fam and Iri get together, if Iri ever does get her curse lifted, whatever happens to half the cast! The creators should have taken a good two more OAVs at least to flesh out the story some more. 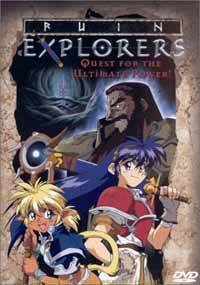 If anything, Ruin Explorers would be a perfect candidate to remake as a television series. A story this good can't be wasted by such a bad ending. But as it is, apart from the manga, this is all there is. It should have been so much more. Recommended Audience: Ten and up. There's no fan service, very little blood - Rugudorull gets sliced and regenerates - and a few bumps and bruises here and there, but nothing really serious. One of ADV's better releases, and bravo to them for distributing it.